You’ve likely met a hard-working, well-educated, and talented business owner who never seems to find success. You’ve also probably met a not-so-hard-working, not-so-well-educated, and moderately talented business owner who’s built a stellar business. How do you explain these differences? It’s simple. The hard-working business owner has a lousy business model and the not-so-hard-working business owner has a great business model. A great business model beats hard work every time. It turns out all those childhood messages you got about hard work weren’t entirely true. Yes, hard work is important. Yes, those who work hard do better than those who don’t work hard. However, without a good business model, hard work is misdirected. As a businessperson, you need to apply your talent and hard work to an exceptional business model. This combination yields a viable and profitable business. 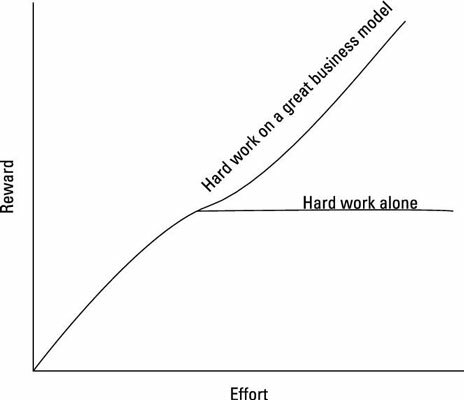 This figure demonstrates how hard work on your business operations alone creates only marginal gains over time. Hard work on your business model and your operations yields a much better return. You should redefine “hard work.” It’s not enough to work hard in your business. You can probably cite dozens of examples of hard-working businesspeople who didn’t achieve the success their hard work warranted. Instead of just working hard, you first need to work hard on your business model, and then work hard on your business. This combination will result in ample rewards for your hard work.